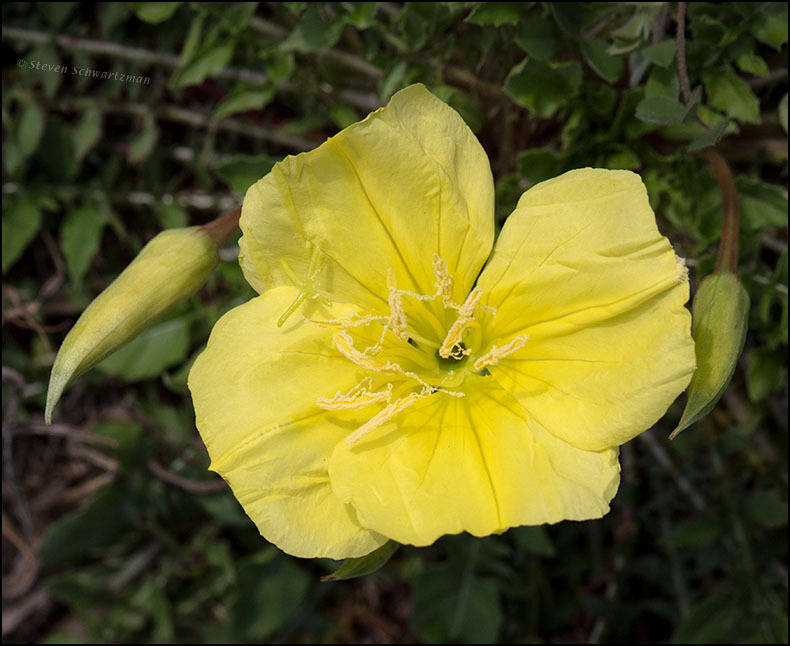 Way back on February 18th I found a bunch of stemless evening primroses, Oenothera triloba, flowering in a lot along Balcones Woods Dr. I don’t recall ever photographing (or at least identifying) this species before, so naturally this is its first appearance here. The two things in the first photograph that look rather like chili peppers are buds. Aiming straight down is the stance I least often adopt when doing portraits in nature because so much that’s on the ground around the subject shows up and often distracts from it. In this case it seemed okay because the flower was so much brighter than the leaves and stems below it. 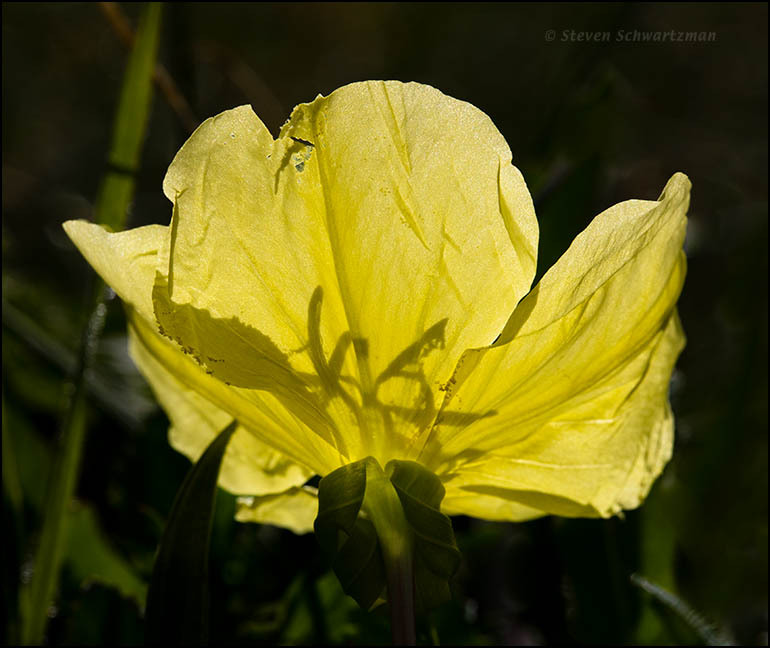 For the second photograph I lay down and aimed sideways to take advantage of the backlighting that rendered the flower translucent and cast the shadows of its inner parts toward me, and now also toward you. To see the many places in the United States where this species grows, you can check out the USDA map. The scroll bar to the left of the map lets you zoom in to the county level. All of these yellow primroses, sundrops, and such are so pretty. I’m delighted to see this one — new to me — since you may have helped me identify a yellow flower I found on the Willow City Loop. It certainly looked like a primrose, but I couldn’t settle on a species. I’ll go back now and see if this might be it. Neither the USDA nor Bonap show it in Gillespie County, but it’s shown in Kerr and Blanco, so it’s possible it could have been on the Loop. The addition of the buds is a nice touch: funny that I saw them as okra rather than chili peppers. Yes, there are lots of these yellow evening primroses. What clinched the identification for me is that the plant consists of a broad basal rosette of leaves from which no branches or stems arise. The only thing that rises from the rosette is the flower stalk. You’ll find this wildflower on p. 273 of Eason’s book, which also says the species is absent from the eastern fourth of the state. You’re right, though, that you may have seen it along the Willow City Loop as a spillover from Kerr or Blanco counties. As for the buds, I can see them as okra too. This is a new one for me as well. You’re right, I immediately thought of chili peppers when I saw the buds. Happy new to us both. Too bad the buds aren’t chili peppers, or I could’ve harvested a few. Yeah, that would have been good. Have you tried growing them? When I worked at the Botanic Garden sometimes they would give us free plants, and so I came home with some chili plants. They were satisfying to grow. Eve once planted some chile pequín, a species native here, by the side of our house. It lasted for a few years but then died. I imagine here it is an annual. Did you harvest from it? No, we missed our chance to harvest from it. I didn’t harvest mine, either, but then I mostly like peppers visually. Thank you for laying down and shooting sideways! I love both photos, but that is a particularly nice view with that lighting. I’m fond of backlighting, and because so many wildflowers grow low to the earth I’ve long gotten accustomed to lying on the ground to get a good view. I even carry a mat with me for that purpose, the ground in Texas so often being inhospitable to human skin. I like the illusion of chili peppers. It adds an extra dimension to the photo. Both photos are beautiful, in their different ways. Thanks, Otto. As the French say: Vive la différence! While I suggested chili peppers, someone else saw okra. This is one of the few genera that I miss from San Luis Obispo. I do not remember their names now. One with pink flowers grows in Poly Canyon. Those that grow in home gardens are quite different, but the flowers look so similar. The color is about the same, but ours tend to grow on the cliffs in canyons, or at least rather steep embankments. I do not know why, but they do not seem to do much in fields or terrain that is only slightly sloped. Now that you mention it, I don’t recall seeing many or our pink evening primroses on cliffs or steep slopes. It is a different ecosystem. There are so many mountains and canyons here that there would be a lot of wasted real estate if some plants were not adapted to live in such situations. There are some plants that live on the nastiest of dry southern slopes that do not do well anywhere else. Sure. One such plant here is mountain pink, which can often be found growing on cliffs or in caliche. In spite of the seemingly inhospitable conditions, the flowers look great.